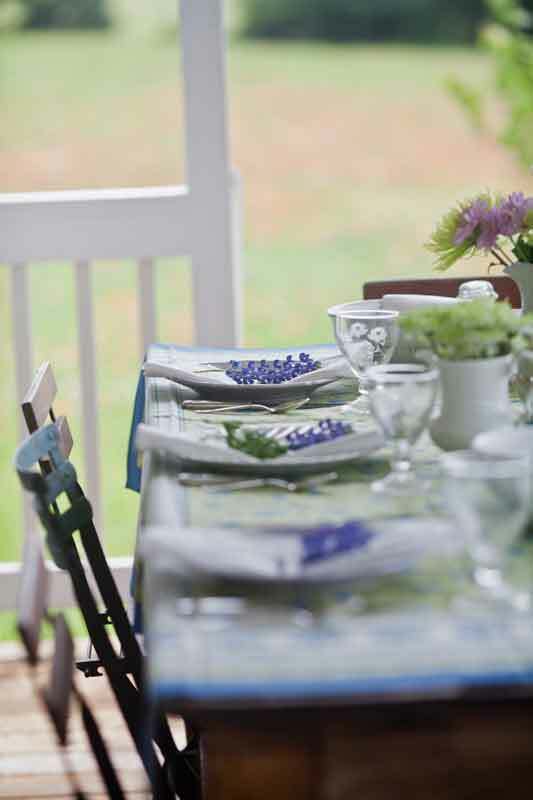 I’m joining 4 other bloggers today for my monthly country French event, and today’s topic is outdoor dining. 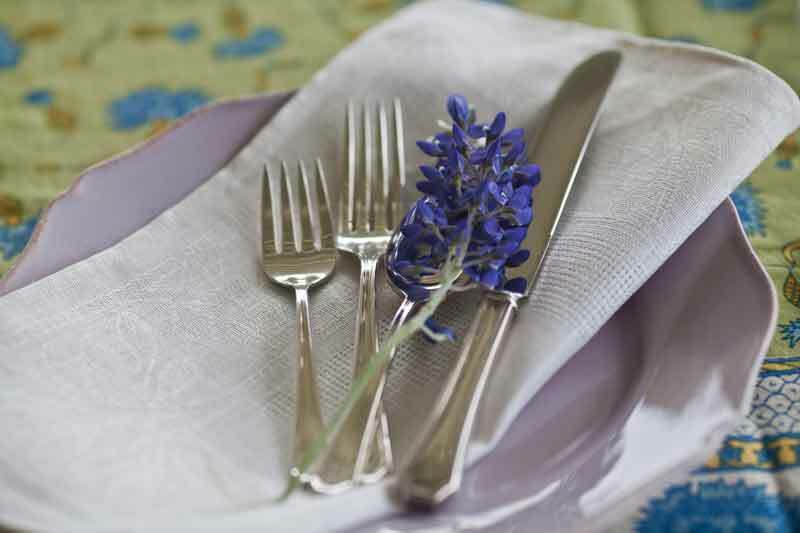 When I think of dining in French style, I’m reminded of a trip to Provence, where we often enjoyed leisurely meals out of doors. And when we went to Italy just a few short weeks ago, there too, we mostly dined outdoors. 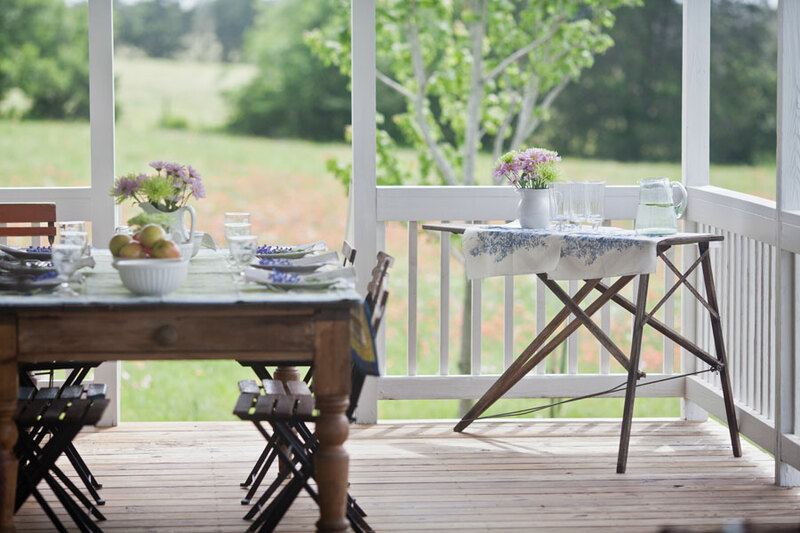 This is my favorite place to take a meal… on my back porch at the farm. In the distance you can see the pink/orange tint of the Indian Paintbrush that dots the pasture. On top of each plate, I placed a freshly picked bluebonnet from the fields. Fresh flowers always remind me of France. 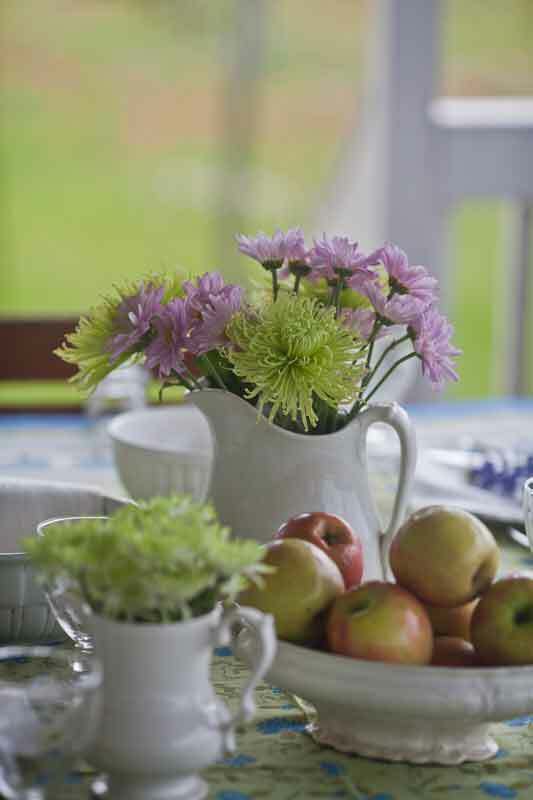 I try to always have fresh flowers on the table when we entertain, even if those flowers or branches came from the farm. The nearest florist is 30 minutes away, so we often grab flowers that bloom naturally on the farm. 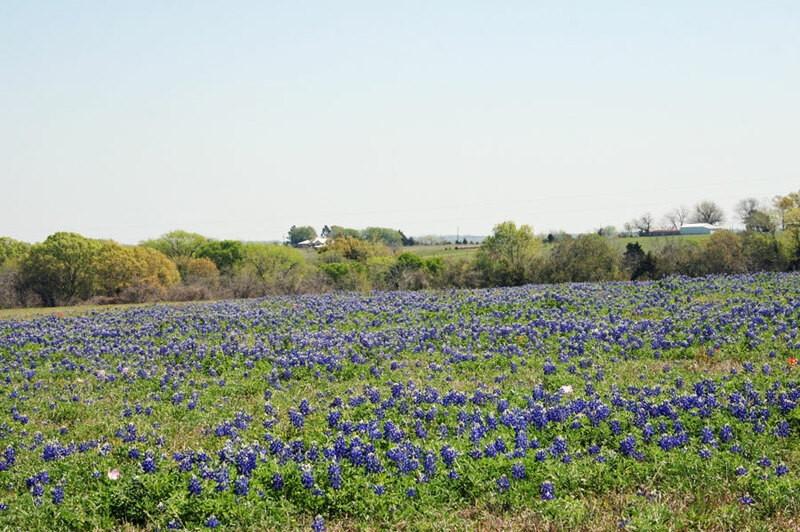 Each year we have loads of Bluebonnets. This year we had an okay amount, not a lot, but definitely they made their presence known. They bloom but for a few short weeks, but during that time, the fields are glorious. 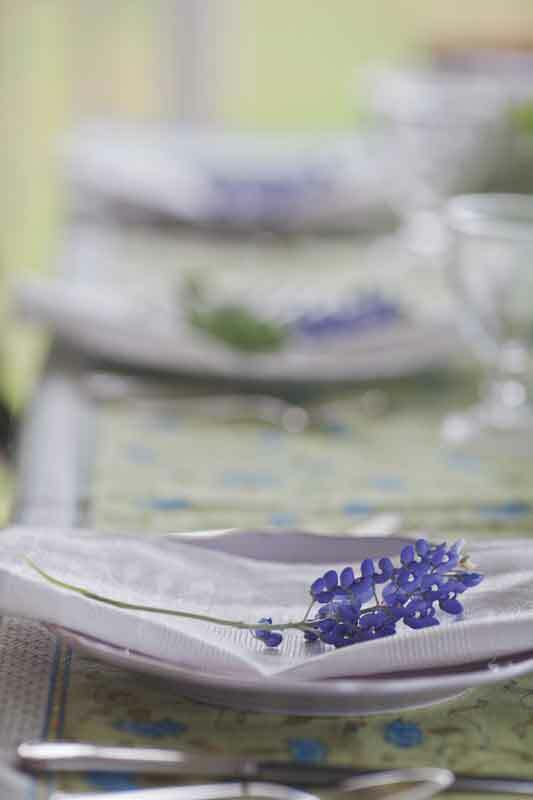 I like the simplicity of one single flower on top of vintage linen napkins. These napkins were a special find at Round Top. The dealer told me that he bought them from a factory that was closing, and that they had never been used. The closing of an American factory is very sad to me. That makes these napkins even more special. One of my fondest memories is a family meal we had on this porch a few years ago. Some of my dear friends were here. I made chicken smothered in a butter, garlic, sun dried tomatoes, topped with goat cheese with a salad, asparagus, and roasted garlic mashed potatoes. We sat around this very table. We laughed, we smiled, we told stories, and lingered. No one dared move, lest the spell be broken. We all knew it was special. The cool breeze carried the scent of the freshly cut hay. No one checked his watch or phone. It didn’t matter what time it was. We were content. My friend Peggy brought a homemade pie for dessert. It was still warm from the oven. Another forkful? Why not? I was stuffed. I used my antique ironing board as a buffet. I think my grandmother would approve. She liked a good meal, and laughter. Even as a child, I adored eating outside. 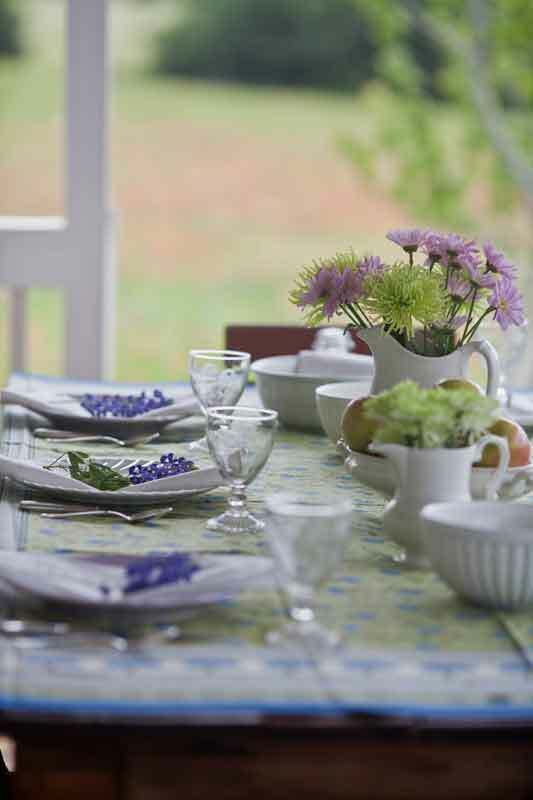 When we went to visit our family, the long tables would be set up next to the vegetable garden. It was a great place to play while we waited for my mom, her sisters and grandma to set out the food. Much of the food on the table came from grandma’s garden, fried okra, corn on the cob, sliced red tomatoes, cucumbers in a bowl of vinegar, and mashed potatoes. All of that was served up with grandma’s roast beef. It always fell apart in a way that made my mouth water. It may be the back porch in the middle of a hay field, but I use my silver. I like my guests to feel special. Family and friends around an outdoor table, fresh flowers and good food all feel very French to me, no matter what language is spoken. Please join the other bloggers at this country French event. This is all so pretty, Anita. 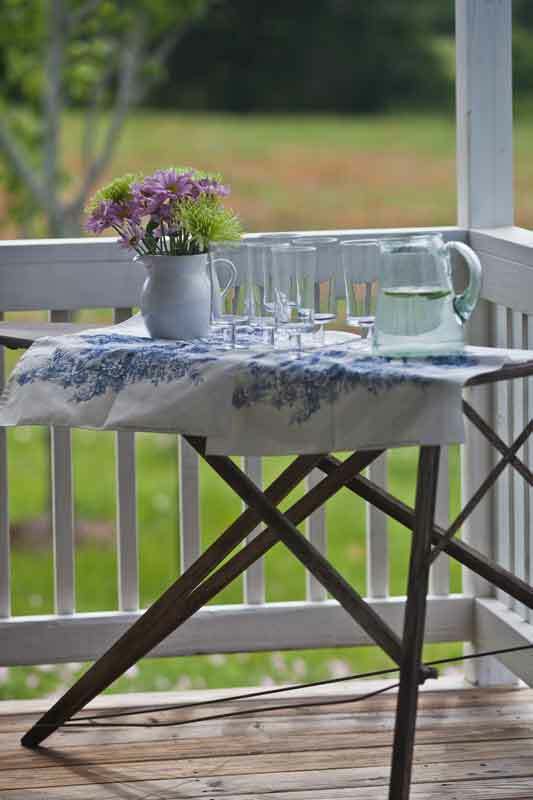 I just love the old ironing board set up that way for the drinks. 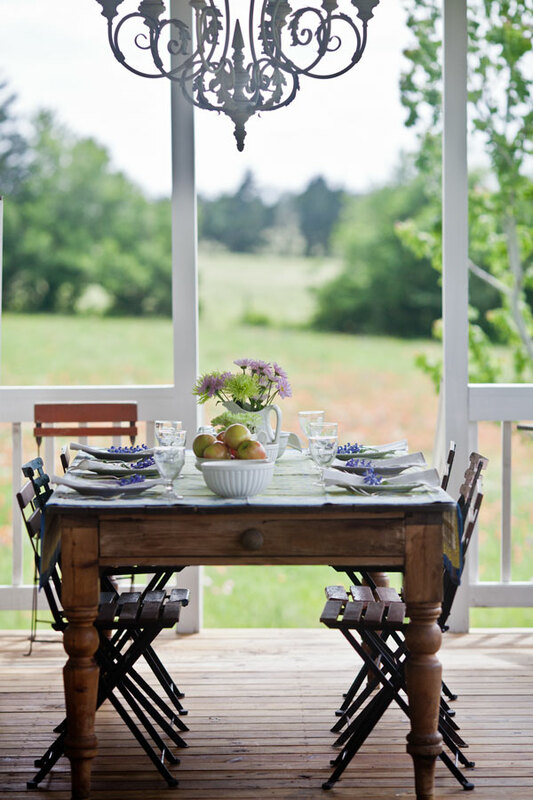 Such a pretty setting- love your porch and table Anita. Oh, it is all so very lovely…wish I were there…however, as long as I cannot be, could I ask you for a favor? Would you post the recipe for that yummy sounding chicken smothered in garlic and butter?? Thanks a million!! I too would love to know how to make that chicken with garlic and butter, and goat cheese! Sounds delicious! Okay I need to get on that. I can just see myself there. But I must say, I think I would be so taken in by the view. A beautiful table set for special guests! I just love the topic of this event and love what you’ve done with it!! I can’t think of a more pleasant way to spend an evening than dining al fresco in such lovely environs. The bluebonnets are an especially wonderful touch! 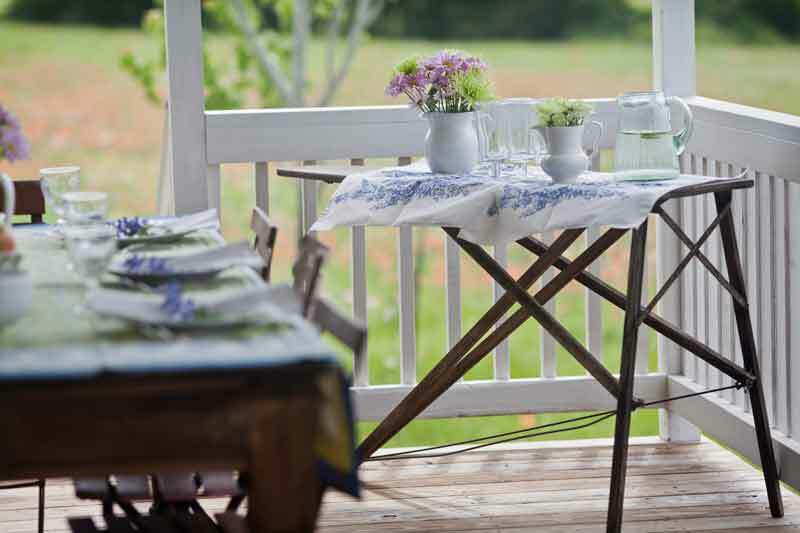 Do you keep your farm table outdoors or bring it out for occasions? The patina adds such authenticity to the whole presentation. Lory, it says out here all of the time. I don’t have room for it in our 1,000 sq ft house. I do cover it with a tarp if it isn’t going to be used for awhile. Beautifully done! Just so charming….. Perfect in every detail! Alfresco dining is usually the best, Anita. You’ve certainly shown it can be simple, yet full of style. I remember that absolutely wonderful meal – the awesome food and the great company. I MUST get back out there. There is nothing like being in your little paradise – with my dearest friend. Love that idyllic setting! I wish I could be a guest at your alfresco table! Nice touches to make your porch have just the right Provencal feel. Some of my favorite memories are eating on the patio at the house we rented…..ahhhh, bliss! I love all the fresh flowers. Using the ironing board as a buffet is clever! Oh, I see why you love eating here!! I would, too!!! Beautiful! Do you not have flies and bugs? Well the breeze keeps them from being a problem, and there is almost always a breeze. “No one dared move, lest the spell be broken” how true this is!! For this very reason, with small parties, I rarely clear plates and leave the porch, it breaks the spell! instead, we stack the plates on the bottom shelf of a tea cart, the top of the cart holds the dessert. No one need leave the porch, the candles continue to flicker and the magic is preserved. This was a Lovely tribute to your family heritage. I love absolutely your blog! It transports me to a simpler time & place in this busy world of mine. And I love country french design & decorating. It’s just delightful, so thank you for sharing it with us. Gorgeous, just gorgeous!! The whole setting is just beautiful, you have mastered the art of tranquility here. Cell phones should not exist in such a place, so it makes perfect sense that you were able to enjoy the perfect dinner! !